British Street Food Awards 2015 – how did Cardiff score? Writer Ellie Philpotts headed to the British Street Food Awards to see how Cardiff’s mobile fare would fare … and here’s the results. 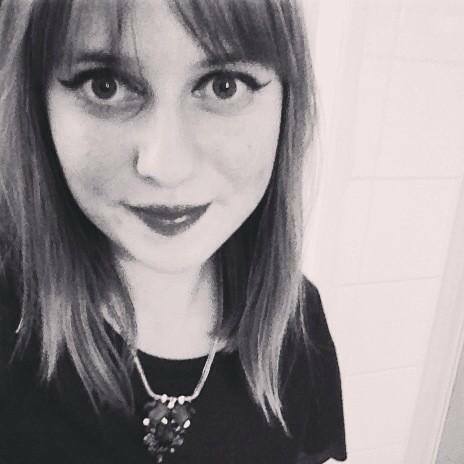 Pretty darned well! The street food industry has undergone leaps and bounds in recent years, and 2015 has been the one that has really made it into a culture. Here in Cardiff, we’ve been lucky enough to demonstrate the best of street food in action, playing host to the wonderful Street Food Circus all summer long. But street food is definitely not confined to the ‘Diff. After the success of the Circus, celebrating the best of Welsh bites such as Patagonia, Pembrokeshire Beach Food, Purple Poppadom, and, proving good food doesn’t have to begin with P, Mr Croquewich and Hangfire Smoke House, it only made sense for me to go to London to witness the big event itself – the finals! So in December I Megabused my way from one capital to another, having effectively starved myself all morning in preparation for all the foodie delights bound to come my way. OK, I did sneak a cheeky Costa at the services, but as soon as LDN rolled into sight, artisan coffees became all I could think about. The grand finale was hosted in the grounds of the O2 Arena, and although Justin Bieber and Little Mix were performing there at that night’s Jingle Bell Ball, in my book the only notable names worth thinking about were the Brulee Van and Cheeky Indian. And they didn’t disappoint. As any We Are Cardiff writer would be, I was eager to see how Patagonia, the only Welsh finalists, would fare, but as the ultimate winners weren’t announced til the evening, I figured touring (and sampling) all the street food would be a hard job, but someone had to do it. First up was The Crabbie Shack. Based in Folkestone, Kent, you’ll also not be short of chances to catch them around London and the festival circuit. They gave me a Soft Shell Crab Burger featuring harissa, avocado and fennel, which revamped everything you’d expect from speedily rustled up seafood. Another stand-out for me was Roadery. 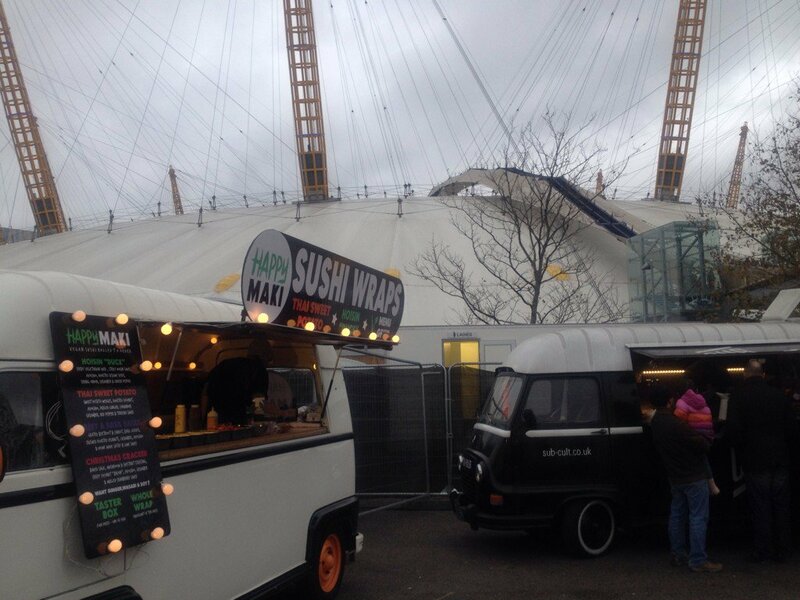 Their tagline is ‘head to tail British street food’, and it’s fair to say they’ve mastered it. Head honcho Dan Shearman’s youth spent in the great outdoors made him develop a great respect for nature. Nowadays, he even forages around Richmond Woods for fuel for his classic Renault van – and we’re not talking boring old petrol. Highlights on his menu include what I’d deem the ‘London Special’ – British halloumi on Brixton sourdough finished with the Earl Grey Panna Cotta, blending the best of English and Italian. However I went for the British Taco – 10-hour longhorn beef tongue with salsa, sour cream, wild blackberry hot sauce, pickles, mint yoghurt and flatbread. Street food fans closer to home may remember The Bowler. Although the Meatballs on the Move van is Covent Garden-based, it was a popular fixture in Cardiff over summer, serving up specialised meatballs – Thai green curry; spinach, chickpea and ricotta balls; pork and beef in spiced tomato; shallots and cumin. And in typical December fashion, they’re even rocking the ‘Christmas Balls’ – Jingle, Sleigh and Snow. I bet Santa would welcome that when he’s had one too many mince pies. Amid the maze of chorizo and hazelnut pizza; beef poutine; shredded lamb; Cornish smoked haddock; vegan sushi; calamari and hoisin duck, you may be wondering where the sugar’s at. 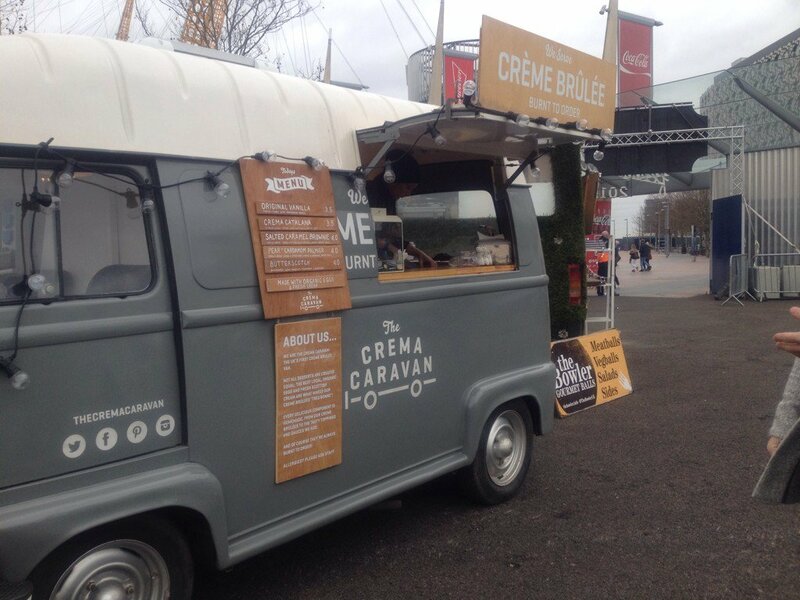 Fear not – Crema Caravan was in business. 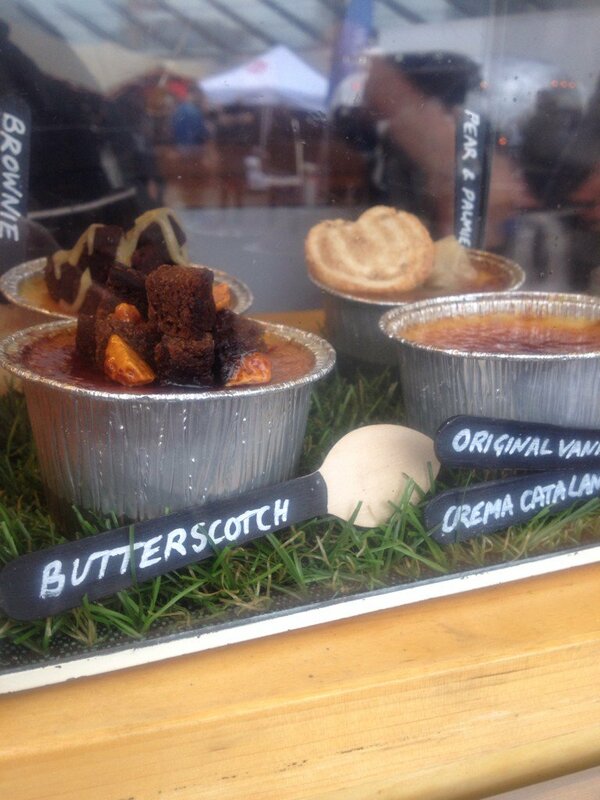 Fluctuating between the British capitals – they’re from Edinburgh, you probably caught them in Cardiff, and this was in London – they’re the country’s first and only crème brulee van, consequently making us question how anyone functioned before them. I couldn’t decide between vanilla; cream catalina; salted caramel brownie; pear or butterscotch, until I did decide.. on pear. Anyway. You probably want to know the results. Patagonia, described by head chef Jamie O’Leary as ‘strictly beef, all Welsh, all local, done with some Argentinian flair’, did well in becoming the only Welshies to make it to London, but missed out on an individual prize. Next up was Best Vegetarian, judged by sandwich entrepreneur Neil Rankin, and ended up being mushroom risotto courtesy of Sub Cult, the London kings of ‘soul in your roll.’ They specialise in gourmet deli sandwiches, and clearly mushroom risotto as well. Foodie king Neil also crowned Sub Cult as the recipients of the Best Sandwich prize, while Best Main went to BangWok. Dong, the man behind the business, has revolutionised Britain’s slant on Thai street food. They’re based in Leeds, but you can catch them travelling all over. Best dessert obviously went to Crema Caravan, while Nelly’s Barn, described as ‘proper job West Country street food’, won the admirable accolade of ‘Best Looking Van.’ Angus and Mitchell, clearly masters of the crispy-fried pig tails and sous-vide steak situation, took the highly-acclaimed ‘People’s Choice’ back to Falmouth. 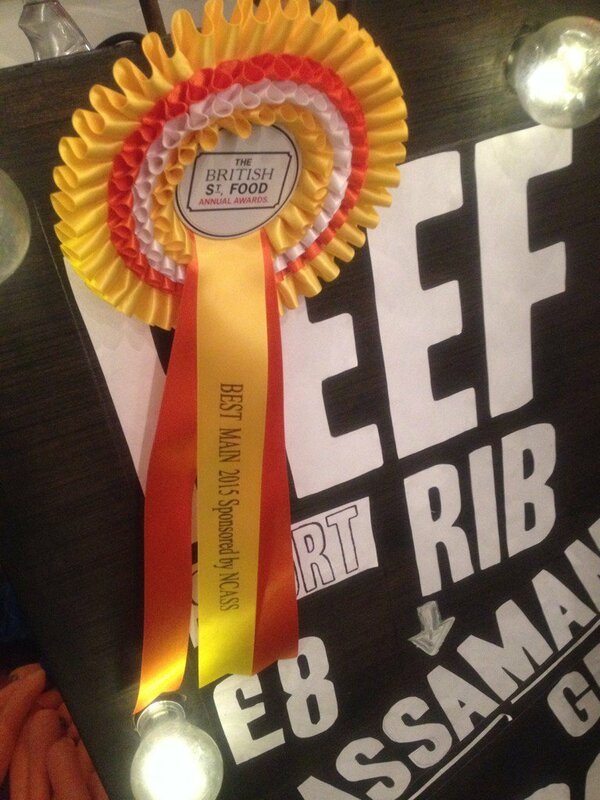 Some may say the biggest award of the night was the ultimate Best Street Food in Britain – an honour granted to Sea Dog. But as We Are Cardiff is a Cardiff publication, in our eyes the hottest category of the weekend was Best Street Food Festival – which went to, you guessed it, Cardiff! Of course, we’re probably a bit biased. But since Street Food Cardiff on Old Staple Yard gave a lot of Welsh vendors the chance to shine; made a lot of Cardiff foodies very happy; and really put the Diff on the street food map, we think it’s deserved. ← Green Man 2016 is coming … tickets on sale!